The Ornamentalist: "Diverging paths of Mannerism"
Pontormo Visitation 1516 (restored 2014) Pieve di San Michele Arcangelo, Carmignano. 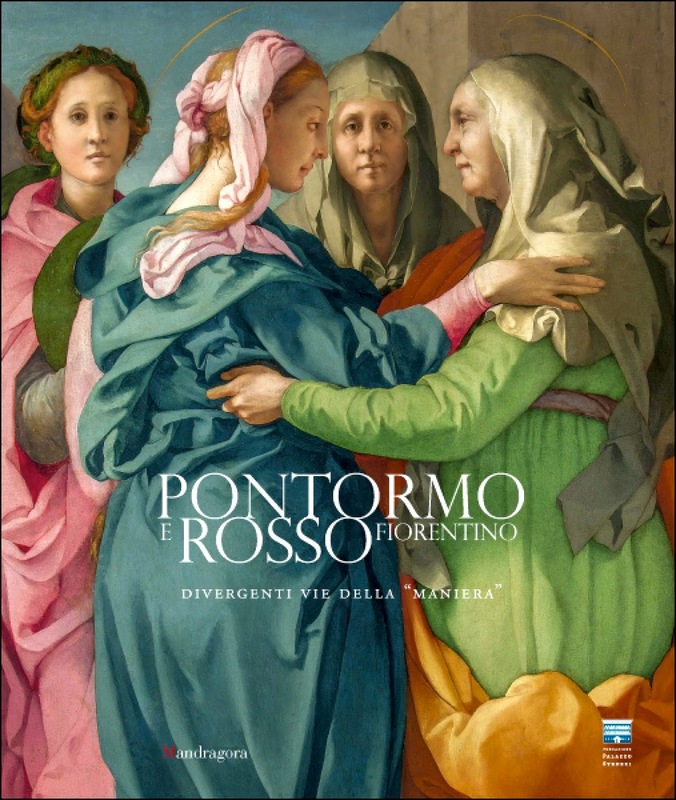 During my recent sabbatical in Firenze this winter, posters for the exhibit “Pontormo and Rosso Fiorentino, diverging paths of Mannerism" began appearing in every street; the glorious image of Pontormo's Visitation (newly restored!) brightening up damp stone walls all over the old city. In March the show opened in the Palazzo Strozzi, I ran over to see it, and it is one of the most thrilling exhibitions I have seen in a long time. If you are in Florence anytime between now and 20 July, go see this show! Beautifully curated by Carlo Falciani and Antonio Nataliell- the show has a clear purpose, to illustrate the real differences between two painters normally lumped together under the label of "Mannerism." This may seem, from afar, like a bit of hair splitting, but the exhibit carefully illustrates the routes each artist took to arrive at their own unique styles. I have to say it was very exciting for me to get to know these painters better; the work is fantastic and the presentation is enlightening. 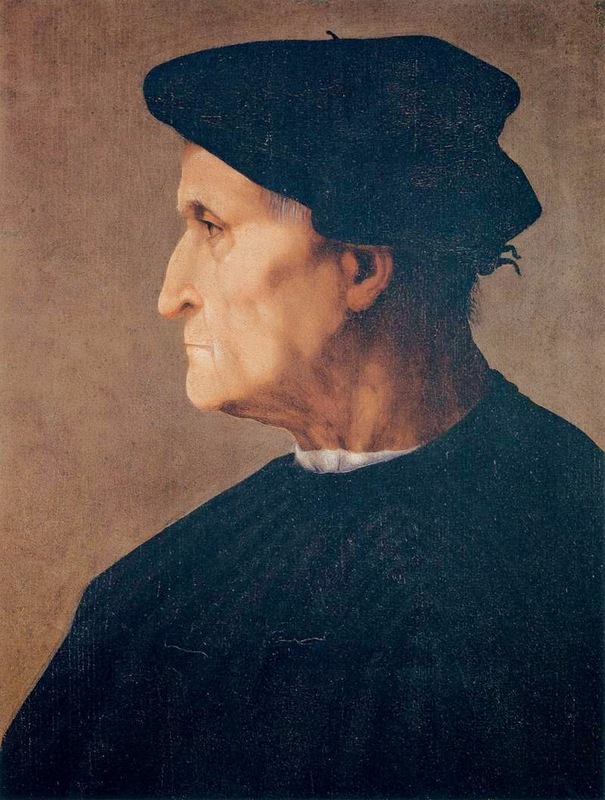 Jacopo Carucci, called Pontormo and Giovanni Battista di Jacopo , called Rosso Fiorentino were both born in the same year, 1494, and received early training together in the studio of Andrea del Sarto. Pontormo found favor with the Medici and developed a luxe, exaggerated, and colorful style of painting, producing highly stylized and finished work, much of it in Florence. Rosso had difficulty securing patronage there, owing to his political leanings, and painted a lot of hurried, unfinished pieces, moved to Rome, experimented (and found success) with printmaking, eventually moving to France where he became one of the leading artists the first School of Fontainebleau. The exhibit starts with a room full of the stunning work Sarto's atelier, and goes on to feature some of the most famous and the weirdest examples of Rosso Fiorentino's earlier work, contrasting this with the colorful paintings Pontormo was producing at the same time. Andrea del Sarto Madonna of the Harpies 1517, Galleria degli Uffizi, Florence. Watch and learn, people. The show did feel a bit like a competition between Rosso and Pontormo, which I felt a bit unfair. The choices of work on display certainly make Rosso's work look a bit weird, with many examples chosen, from what is available in Florence, being simply unfinished paintings. Rosso's work is often called anachronistic and indeed his portraits of unidentified patrons look old-fashioned, but as an artist he took some great risks with his work, and he went on to become a superb designer. Rosso Fiorentino, Portrait of a Man oil on panel 1522, Galleria Palatina (Palazzo Pitti) Florence. This modestly dressed and now-unknown man was obviously not a Medici supporter. Without patronage and a secure, supportive environment it is really difficult to produce such masterpieces as Pontormo was able to do. 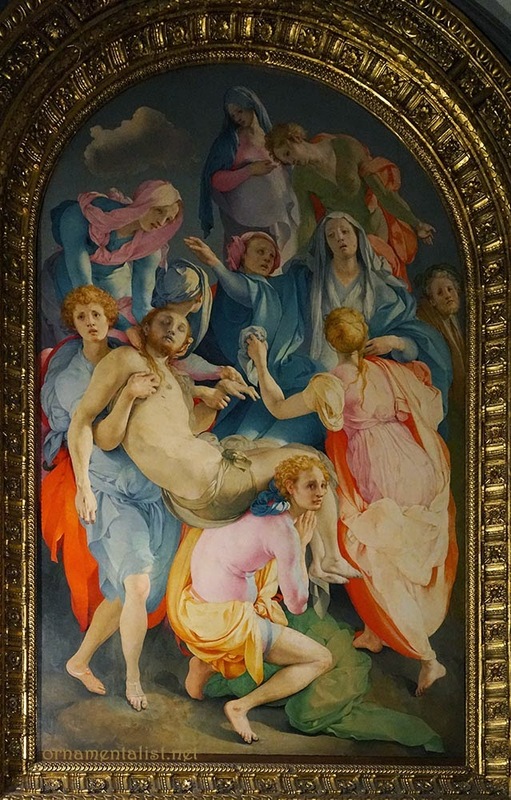 Everything in Pontormo's work from the subject to the choice of (expensive) pigments points to large budgets and generous, supportive patrons. I went to see the show a further three times, twice with fellow mural artists, Steve Shriver from Los Angeles, and Pascal Amblard from France. We painters all mentioned this one issue: an artist designing an altarpiece or other large panel is generally doing so site-specific... so the setting is a part of the design. When I look at a larger painting I immediately think of the problems the artist had to solve and the decisions that needed to be made: how high off the ground will this be, from what angle or distance will the viewer see it, how much light is in the space and how strong do facial features need to be to communicate given these variables? Take those altarpieces down and put them in a gallery with a spotlight on them and you are basically removing those variables and possibly judging the work in an unfair light. 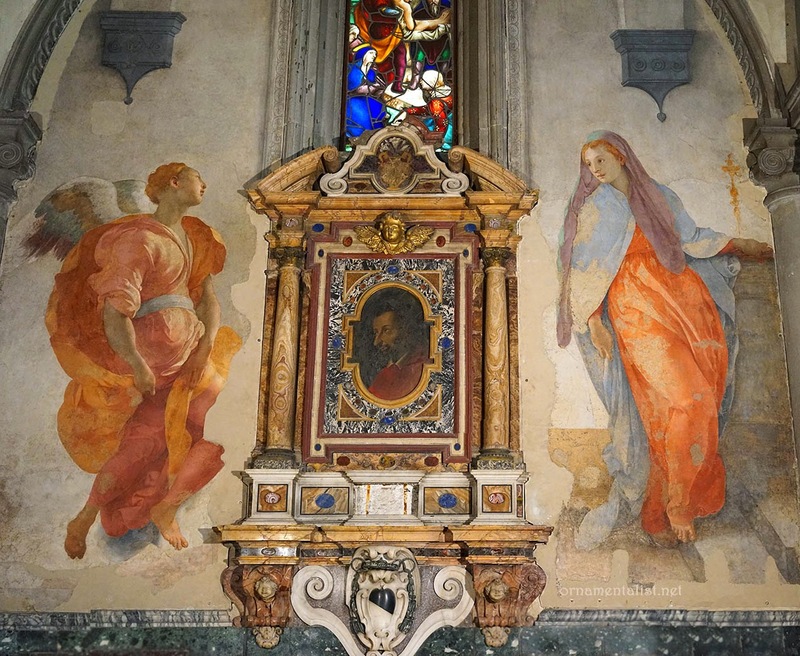 Fortunately in Florence, you can see a lot of wonderful work in situ, from all three of these artists; the most marvelous example I can point to is the Capponi chapel in Santa Felicita, for which Pontormo painted the stunning Deposition as well as the glowing and ethereal Annunciation. I came away from this exhibit with a much better appreciation of Rosso Fiorentino's work, in particular his work in the newfangled field of printmaking, but also as a daring and skilled decorative artist. Pontormo comes off as an especially fantastic draughtsman, a great painter with an exuberant sense of color. 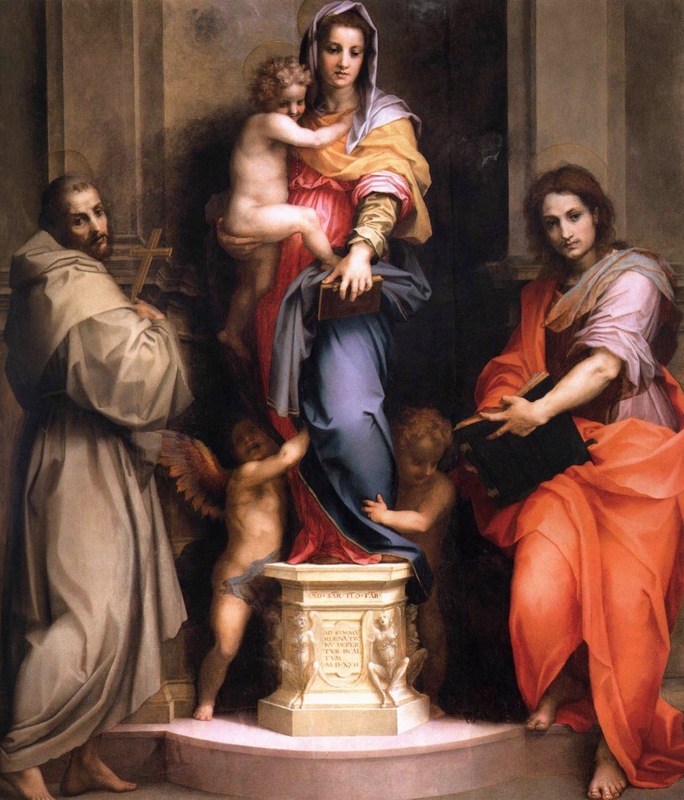 But more than anything, this show renewed my interest in the work of Andrea del Sarto. So then--- I made the trek out to the Vallombrosan convent of San Salvi to see Sarto's Cenacolo. This is a splendid mural and well worth the visit. I spent a good couple of hours with this one. Just bowled over. 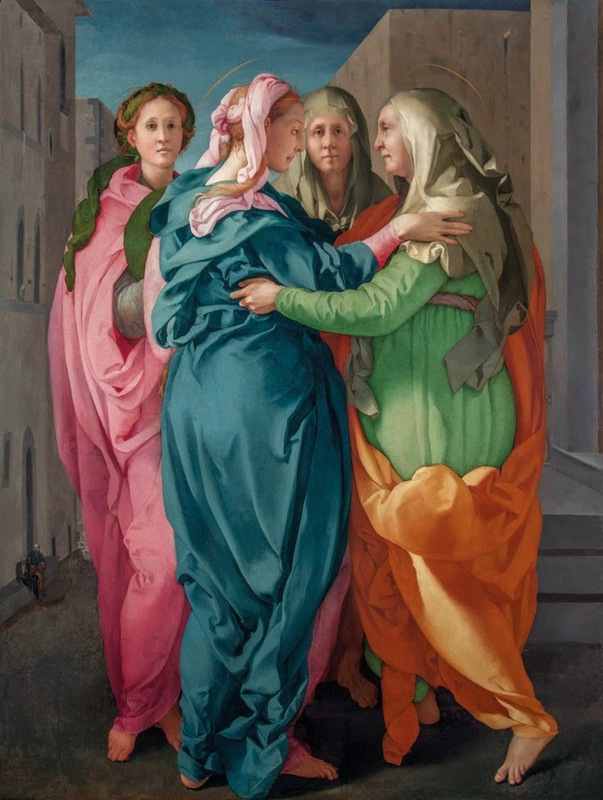 ArtTrav, a fascinating blog written by an art historian living in Florence, has a nice article on the restoration of the Visitation by Pontormo. Also, have a look at this post on how to make a nice morning of a visit to the Cenacolo at San Salvi. 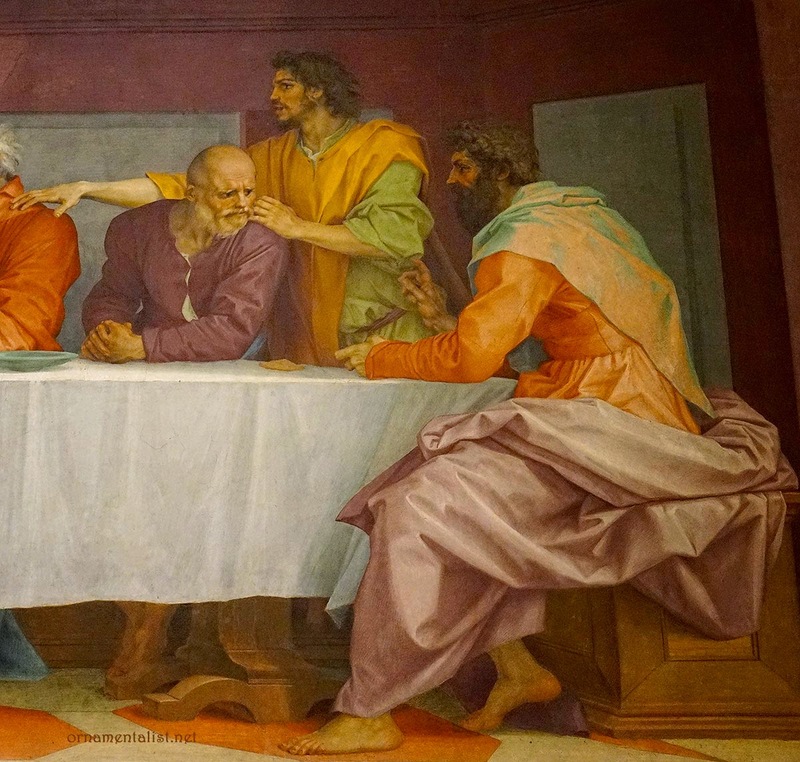 I would also suggest a visit to the Basilica della Santissima Annunziata, where there are many site-specific works by Sarto, Pontormo, and Rosso Fiorentino, among others. "Pontormo and Rosso Fiorentino, diverging paths of Mannerism" at Palazzo Strozzi through July 20, 2014. Allow at least one hour to see the show. 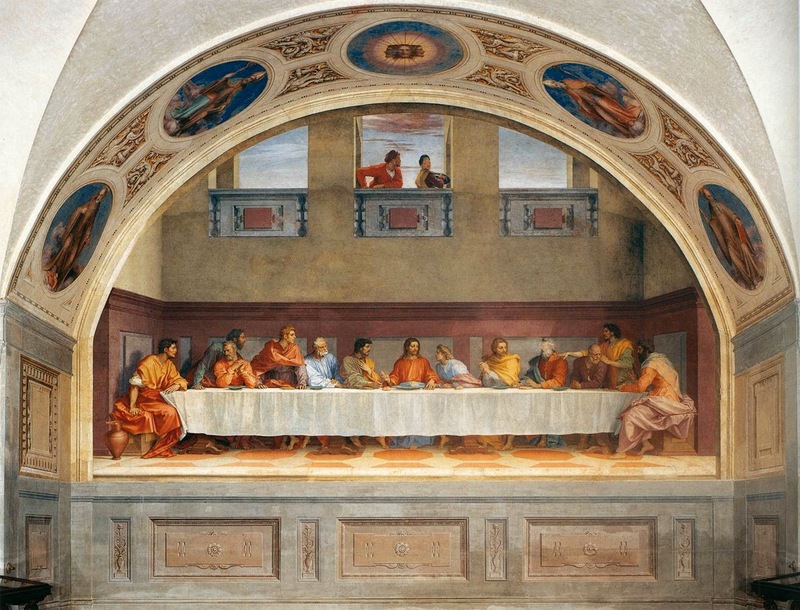 Tip: Palazzo Strozzi is open until 11 PM on Thursdays for after- dinner art viewing. Nice! I will always remember walking through that show with you. Did you ever make it to Poggio a Caiano? BTW- i have a site for you to link my name to- it's www.steveshriver.com. thanks for the link, I thought I had your link there but it was misspelled :^( happens to me all the time! I did make it Poggio a Caiano at long last. 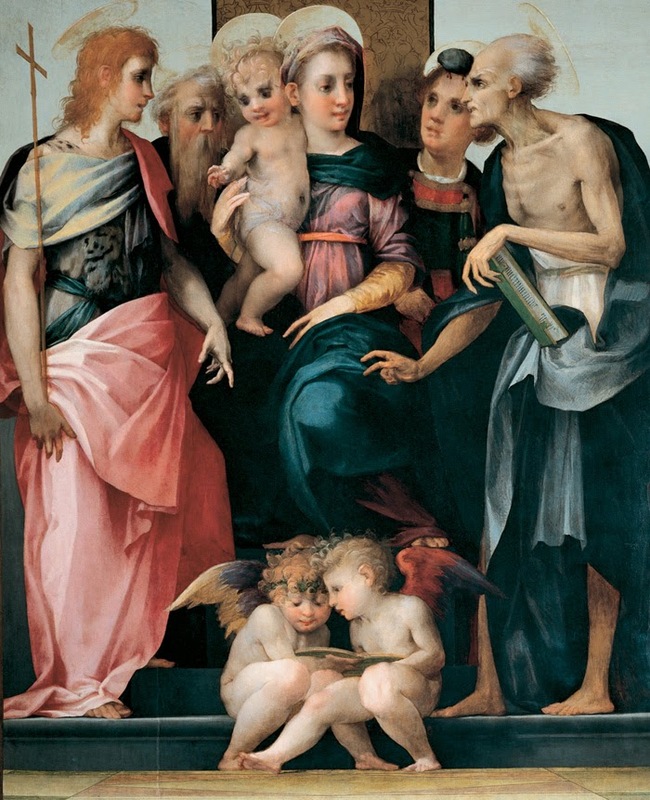 Great work from both Sarto and Pontormo there. And the 19th century work there is outstanding. I know! wasn't that trompe l'oeil entry just spectacular. And the billiard room!!! Did you sneak any pics?